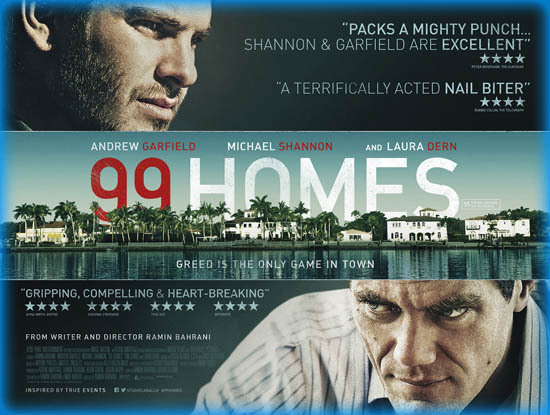 In the opening scene, Michael Shannon, a rising Florida real estate broker, walks out of a house where he has just attempted to evict a man. The tenant has blown his brains out in the bathroom. Shannon cares not a whit; he has the lives of many more good, hard-working, decent Frank Capraesque archetypes to ruin, and there are only so many hours in a day. This is the most subtle part of 99 Homes. I get the sense they show this picture to Bernie Sanders volunteers to get them jacked up before they go door-to-door. Shannon soon moves to the house of Andrew Garfield, a construction worker who is behind on payments for his childhood home, which he shares with his mother (Laura Dern) and son. Garfield gets the boot through the collusion of the courts, the sheriff and indeed, modern American capitalism, but fate brings him back to Shannon, who sees something in the lad. Soon, Garfield is working for Shannon, evicting a passel of George Baileys and making serious bank. But what does it profit a man to gain the whole world and forfeit his soul? Yup. It’s that kind of movie, a bludgeon, without a hint of nuance or depth. It’s also repetitive (if you want a “how to” on evictions, this is your flick, because we see scads of them) and unwittingly undermines its message. Garfield is a pretty stupid poor person and an even dumber rich person; he equivocates and Hamlets through the entire picture, so much so that you actually feel bad for the devil Shannon in having to negotiate the soul of this dimwit. Also, director Ramin Bahrani obviously knows squat about the Florida police. The film ends with an extended scene where a man resisting eviction fires a rifle out his window at the cops numerous times and yet, miraculously, they don’t shoot him. Poppycock. Shannon is the only reason to see the movie; he does his level-best to give real estate Satan some heft and depth, and he is one of the most interesting actors around. Naturally, the movie was adored by the critics (“makes you understand how this poisonous financial ecosystem thrives” – David Edelstein; “nails the predicament in which so many working-class folks now find themselves. Although they cling to the American dream, for many of them it has become a nightmare” – Calvin Wilson), who – as everyone in the know knows – have for years been in the pocket of the anti-eviction lobby.